It's Easter today, and one of my friends' Facebook statuses reminded me of a little fact that I gleaned from Wikipedia a while back. It's always bugged me that Easter changes every year, seemingly at random. When I went to look this up, I found out that it's not quite random, but is horribly complicated. There's a very long writeup over at Wikipedia that I couldn't quite wrap my head around, but the bottom line is that the sequence of Easter dates repeats only after 5.7 million years. 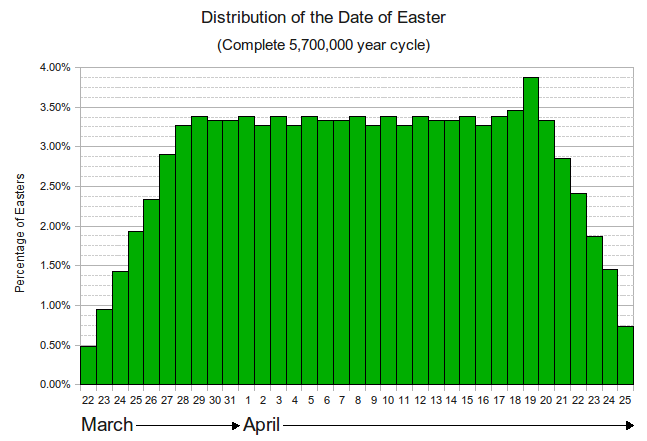 I made up a graph from the percentages I found of how often each date is Easter, and then found that Wikipedia already had a graph very similar to mine. Of course, I thought mine looked nicer, so I uploaded it as a replacement. And as you can see, this year is actually a pretty average Easter date, as you can see: I hope you have enjoyed this bit of random trivia resulting from idiosyncrasy piled upon idiosyncrasy, with a touch of tradition to make it that much better.